From the Bestselling Author of Real Estate Investing in Canada 2.0 What can you learn from four Canadian real estate experts who have 100-plus years of collective investing experience? 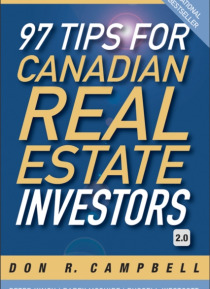 Whether you are a beginning investor or own a portfolio of residential properties, 97 Tips for Canadian Real Estate Investors, 2nd Edition provides you with insights, strategies and success stories to build your wea… lth according to a proven system. Investors will learn about how to adapt to shifting market conditions, and financing and marketing strategies designed to improve cash flow and attract long-term tenants. You ll discover the challenges and pitfalls that investors experience and how to avoid them. At your fingertips and success strategies based on the Authentic Canadian Real Estate System. From understanding the principles and economics of Investing, to sourcing properties and financing, closing deals and becoming a landlord, 97 Tips is chockfull of great ideas for investors who want to achieve beyond their dreams. Praise from Canadian Investors for Real Estate Investing in Canada and the Acre System This material was absolutely essential for getting my investing jumpstarted. Thank you! Marianne Malo Chenard To compare this system to other real estate investing educators is like comparing day to night. I get all the information on a proven system I need. I don t have to pay thousands of extra dollars to get the Next level of training. Michael Colson If you are serious about taking control of your finances through real estate, this book is the perfect starting point. Joe Iannuzzi Excellent advice on how to make profitable business decisions and how to know what the red flags are. Kimberley Pashak Special Bonus Stay ahead of the real estate market. As a bonus, every registered reader of 97 Tips will receive a free CD covering the latest market changes. Register at www.realestateinvestingincanada.com.